Another postcard from my travels. It's raining with mist hanging low over the city. I imagine it is rather weird being in the top stories of the incredibly tall buildings here, seeing nothing but cloud. Maybe sometimes they are above the cloud. Hasn't dampened my spirits in anyway. I feel it gives the city an added air of mystery. No wonder so many writers love this place. I had the good fortune to meet one such person on my first day. I had just finished reading 'The last Chinese Chef' on the plane. My first day I literally stumbled upon an event organised by the local literary club. The author was giving a talk about her book. As always don't forget to visit other skywatchers around the world. Great capture, I just love photos with fog/mist, very intriguing. excellent photo. To be in China without a camera, uggh! that would be cruel. Fascinating! What an intersting life you lead! All the best. Ciao. 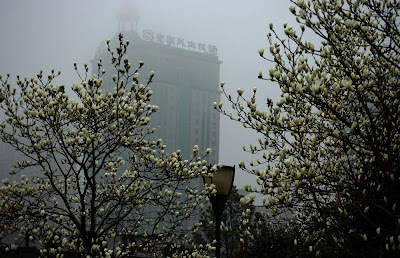 A.
Lovely.. it invites me to China..
it's very nice in spring.i like the trees, flowers open. How beautiful! Lovely photo and what luck to stumble into the author's talk! I love misty mornings. We hardly get any in Manila, so it's always a treat to go to a town with higher elevation. This is such a lovely, atmospheric photo especially with the trees in bloom. And talk about serendipity! Did you ask her to autograph your copy? Gorgeous photo. You are incredibly talented. I find myself looking forward to each of your posts. Lovely foggy sky. Love the tree in the foreground. So far away yet it reminds me of the sea mist we get here. Always mysterious.